Which Alutex Awning Meets your needs? Sunbrella fabrics are engineered for a serviceable lifespan two to ten times longer than conventional fabrics. The environmental impact of producing cotton canvas, for example, must be multiplied many times to compare it with Sunbrella's extended longevity. 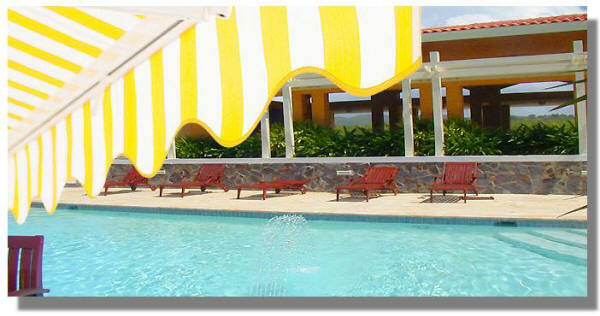 Sunbrella fabrics offer significant sun protection. The Skin Cancer Foundation recommends Sunbrella* as an aid in the prevention of sun-induced damage to the skin. Please use shading products featuring Sunbrella as a part of your complete sun protection regimen, including regular use of sunscreen. 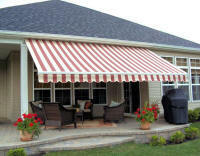 Alutex Awnings has a full line of retractable awnings, also known as lateral arm awnings. 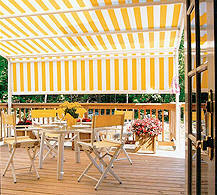 The Madera Reractable Heavy-Duty Awning used for both residential and commercial applications. When totally retracted, Madera discreetly rests within a few inches from the wall, eliminating any need for winter storage. Designed to provide a heavy-duty shading solution with special attention to public use such as outdoor cafes, public gathering areas, and other public locations. Madera’s pitch adjustment carries a lifetime warranty and responds to arm projections up to 13’. The Madera Commerical has heavy-duty brackets, with high-gauge steel back tube and the extra aluminum gauge of its arms. Our Cape Cod has stainless steel hardware to supply the best performance of its parts especially under the most stringent weather conditions. The “cassette” Cape Cod design encases the fabric when retracted to provide addition protection fomr the elements. 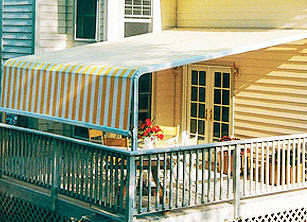 The Giant Awning is by its own name the largest retractable lateral arm awning on the American market today. It has a unparalleled maximum projection of 20'. Because of the high tension of its heavy-duty arms, the Giant lateral arm awning, comes with a cradle center support to maintain the perfect fabric tension along the rolling tube. 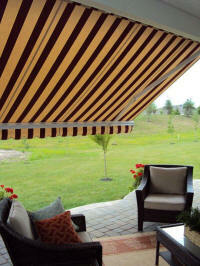 The Malaga is an extended coverage retractable patio awning. Either manual or motorized, Malaga is the perfect solution to provide a summer extension to any home and yet offering the same protection of a stationary awning without the inconvenience of winter storage. Our Antigua lateral arm awning uses a full cassette style hood that completely encloses the awning when it is fully retracted. The Antigua Awning provides our answer to the most contemporary demand for a complete cassette containing the whole awning when fully retracted. Built only with the finest materials and finished with electrostatic powder coating epoxy paint, the Antigua lateral arm cassette awning, assures the most durable and yet elegant awning product by resisting against chipping, cracking, and fading. Thanks to the reduced height of its brackets, Eclipse allows installations in as little as 5 1/4”! The strength of the Eclipse awning parts allows it to extend up to a 10’ projection . The tension of the arms is maintained trough double stainless steel cables protected by UV resistant coating. The Trio - Awning for when you need an awning that is longer than it is wide! Designed for special installations where the projection of a regular lateral arm awning is limited by the available width. This exclusive retractable awning can extend beyond normal width limits by reaching up to 13' in projection in as little as 8' of width. Particularly useful in condominiums and narrow patio applications. Our Trio can be installed like any classical retractable awning. No more need for overlapping arms. Its special design allows to virtually retract its arms within the same space as a regular lateral arm awning. The Nova is Alutex’s reliable and affordable response to price sensitive retractable awning solutions. Elegant and yet affordable, Nova is built to respond to those in search for a price sensitive retractable solution to shade their deck or patio.